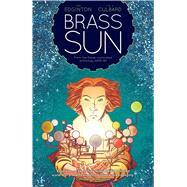 by Edginton, Ian; Culbard, I. N. J.
Wren's father has revealed to her the secret of their world, that it is only one of many in a clockwork solar system; but it is dying and to save her home, she must first escape it. This is a wholly original new SF-clockpunk series from the bestselling artist of New Deadwardians and the hit writer of Scarlet Traces and Hinterkind. Ian Edginton has written several strips for 2000 AD, including Stickleback, Ampney Crucis and Leviathan. His non-2000 AD work includes Dark Horse's Aliens series, The Authority, Blade, Deadline, The Establishment, Scarlet Traces, and recent Vertigo hit Hunterkind. Having illustrated a comic version of A Picture of Dorian Gray and an HP Lovecraft adaptation for Self Made Hero, artist I.N.J. Culbard teamed up with Dan Abnett on the DC bestseller New Deadwardians before working for 2000 AD. Together Culbard and Edington have seen their comics adaptations of classic Sherlock Homes novels meet with great success and acclaim.